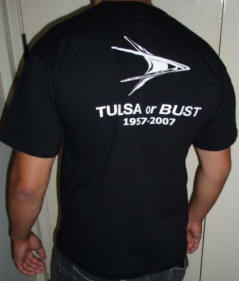 Glenn Barratt from New Zealand is selling MoPar Tulsarama "Tulsa Or Bust" black T-shirts. 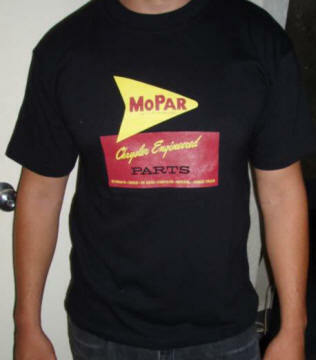 Brand new, black MoPar short-sleeved quality T-shirt. Front features picture similar to parts boxes used in packaging parts for 1955-1961 MoPar parts. Rear features the long obsolete MoPar ForwardLook "Flying Double Delta" double boomerang image, with text below that reads "TULSA OR BUST 1957-2007". Limited run of these black commemorative T shirts available in Medium and Large. Secure your souvenir T shirt of this once in a lifetime event. A donation of US$1 will go directly to the FWDLK website for each and every shirt sold through this ad.